The Huskies often looked ready to take over the game, but a multitude of errors allowed Arizona to force overtime, where Washington scored first and held for a 35-28 win. Next: Stanford. After almost a month of dining on cupcakes, the Huskies had a hard time with a dinner of cactus Saturday night in Tucson. Two missed field goals, a red-zone interception and four sacks of QB Jake Browning nearly wiped out months of high expectations. But due largely to an astonishing game from junior RB Lavon Coleman, ninth-ranked Washington (4-0) prevailed 35-28 in overtime over an Arizona team that nearly trap-doored the Huskies again. Browning’s four-yard bullet to WR Dante Pettis, a pass intended for teammate WR Chico McClatcher deeper in the end zone, gave the Huskies the lead in OT. Then the defense denied the Wildcats’ remarkable sophomore backup QB, Brandon Dawkins, to preserve a much-anticipated match of unbeatens Friday on national TV when 4-0 Stanford comes to Montlake — the fourth top-10 matchup in Husky Stadium history, and the first since 1997. The Huskies piled up 352 yards rushing, including 181 on 11 carries from Coleman, to offset assorted penalties, missed tackles, special teams errors and blown assignments from a team that apparently was a little too smug after three lopsided victories over lesser opponents. The Huskies hadn’t won since 2006 in Tucson, a place of many pratfalls for Washington. After a dominant opening drive in the second half gave UW a 21-14 lead, the next four possessions ended with a turnover on downs, an interception, a missed field goal and a punt. Another desert whammy seemed imminent because Arizona tied the game at 21 with 4:25 left on a 66-yard drive capped by Dawkins’ two-yard TD run. But with 3:25 remaining, Coleman, who supplanted starter Myles Gaskin in the late going, broke free on a 55-yard romp for a 28-21 lead. Dawkins responded with the play of the game. On second down and 25 at the Arizona 15, Dawkins, a 6-3, 210-pound speedster making his third collegiate start, somehow backpedaled out of a sure sack by Huskies strongman Vita Vea. That bought enough time to find WR Shun Brown behind Washington’s secondary for a 54-yard completion. Four plays later, the game was tied at 28 and headed to OT. “It was an amazing play by him,” Petersen said. “I don’t know how he got out of Vita’s big, strong arms, I don’t know too many who can do that. Th guilty party was CB Budda Baker, who earlier missed open-field tackles on consecutive plays. The preseason All-America pick had 10 tackles, but has had more than his share of missed assignments. On the Huskies’ possession in extras, Coleman covered a multitude of sins with a startling 24-yard dash to the one-yard line. He appeared to have a leg injury and came out. Gaskin, who finished with 85 yards in 24 carries, was knocked back for a three-yard loss. Then a low-percentage pass play, a fade to John Ross, went out of bounds. Suddenly it was third down, and the most important play of the season was upon Browning. He responded by seeking out McClatcher and finding Pettis for the go-ahead TD. When the Wildcats were stymied on their OT possession by a 4th-and-10 incompletion, the Huskies had survived their first Pac-12 Conference game and first road test. Barely. Browning completed 14 of 21 passes for 160 yards and two TDs. More impressively, he had 11 carries and 48 yards rushing, although sacks reduced the total. Most impressive of all, on the 32-yard reverse play to Ross that resulted in Washington’s first touchdown, Browning threw the block on a 280-pound lineman that sprung Ross. 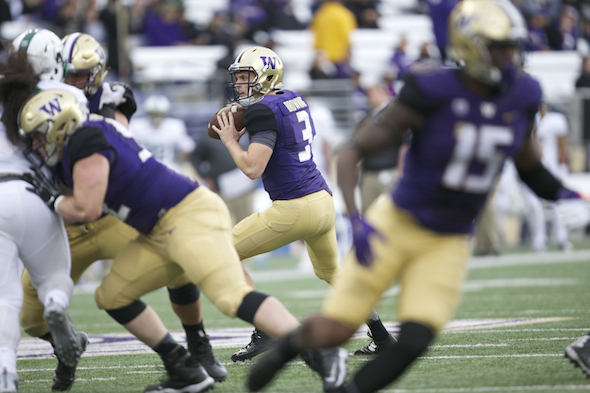 It was part of a concerted effort by the Huskies to wear down the smaller, faster Wildcats. Work on the power game was probably aimed as much at the Stanford game as the Wildcats. The Cardinal loves to mash. And the Huskies get only four days to clean up a month’s worth of mess. The Pac-12 has some really good coaches and it is tough to just out talent any team. Weak non-conference teams do little to prepare you for league play. Now instead of focusing solely on Stanford this week, time must be expended on cleanup. The Huskies may have set a new record for blown opportunities. For all their talent, it was a frustrating game to watch . . .
You have pretty much covered it all Art – The adds I have are how close this game was to a much bigger Husky win if Jake was accurate on a few of the longer passes he missed, had not made that horrible roll-out interception in the end zone and had Van Winkle not been wide on both his field goal attempts. Jake said the pass to Pettis was high. I agree the DB’s including Baker blew their coverage on the Dawkins 54 yard prayer. We made Dawkins a Heisman candidate with our terrible coverage and weak pass rush. I just hope they can see the errors of their ways in film room and recover in time for Stanford! Of course, we won’t mention how Vea had just been tackled by an Arizona OL on that play–nor the phantom PI call, nor any of the many, many times when the home team got an extra half-yard or more on the spotting of the ball while the visitors got that amount taken away, nor any of the several instances of holding by the Wildcat OL. We won’t mention them, because that’s how every game in Tucson gets called. “…we need a month to clean this up…” Well there goes living in the top ten poll.